Welcome to the sixteenth installment of the EVE Blog Banter, the monthly EVE Online blogging extravaganza created by none other than me, CrazyKinux. The EVE Blog Banter involves an enthusiastic group of gaming bloggers, a common topic within the realm of EVE Online, and a week to post articles pertaining to the said topic. The resulting articles can either be short or quite extensive, either funny or dead serious, but are always a great fun to read! Any questions about the EVE Blog Banter should be directed tocrazykinux@gmail.com. Check out other EVE Blog Banter articles at the bottom of this post! I am most definitely not an EVE Veteran. I’ve only been a Space Cadet for about 10 months now. When I first began my career as a Capsuleer I took many a wrong turn and spent countless hours literally lost in space. I almost became dizzy thinking through this new Blog Banter and what I could potentially say. 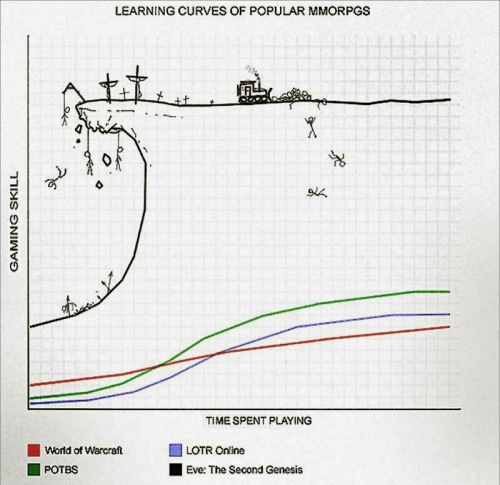 After all, who can forget this iconic image that so perfectly and succinctly describes EVE Online? Nonetheless after much thought, and a few Excedrin, I drew a few conclusions that I felt would have best helped me get through those first, few difficult weeks in New Eden. When in doubt, right-click! – It’s no secret that in order to grasp the UI of EVE you must hold a Doctorate in Quantum Physics. It’s a complex monster that takes awhile to fully understand; EVE is a complex game afterall. Yet the context menus are, for the most part, fairly well organized. All major functions that you need to worry about can usually be found if you right-click on an item. This is a big no-no in traditional UI design methodologies (negative points for no user discovery) but once you know about it, it’s a godsend. Not-So-Secret Agent Man – It was never fully clear to me what a player Agent truly was. Understanding the levels, qualities, and affiliations would all have been great info to have. But none more important than knowing how to find other Agents! By going to your characters ‘Standings’ tab and inspecting the info of the various factions you can see what Agents belong to said faction and are available to you. You can then chart a course to their home system and station. It was simply never fully mapped out as to why this was important and I would wander aimlessly about doing missions for Agents with no knowledge that increasing standing with an Agent and Faction led to higher mission levels and payouts. Road-map to the Stars – Skills are obviously a big part of what makes EVE EVE, and your success or struggles nearly always depend on what your current abilities are. Yet there is no clear and easy way to see skill associations or prerequisites and there is minimal guidance as to which skills are important and why. Further complicating the matter is the fact that you cannot easily map out skill plans (this was an even greater problem before the Skill Queue, fortunately for me the queue was available when I started my Capsuleer career) Vital tools like EVEMon should nearly be built directly into the EVE Client. Also, having some basic guidelines would have been a great start (i.e. – Want to blow things up faster? Follow this path young Padawan), similar to what I assume Certificates were probably meant for, but ended up being way to complex to be useful. Thus great guides like the one from Kylania should be front-and-center in new player tutorials. No. Try not. Do… or do not. There is no try – EVE will try your patience. There is no easy way around it, for many players, especially those new to MMO’s, New Eden can be a dark, dangerous place. Again, part of what makes EVE so wonderful is that you can do practically anything, any time, to any one…be it good or bad. You will not find another quality MMO being associated with the words “Rage Quit” as many times as you will with EVE Online, that’s just how it is. Now, I’ve been described as a bulldog at times, endlessly stubborn and tenacious, thus why I think I’ve been able to stick with EVE through all the frustrations. I just feel sorry for all the Labrador Retrievers out there in space since there is little sympathy to be found. You just have to be prepared for it. Never Enough Learning! – “Learning skills are important”, now that’s an understatement. Understanding how much time will be saved by training those learning skills as high as possible can never be easily appreciated by a new player. Spending 30 or more days to train those skills to an “acceptable” level just ain’t fun, period. Yet if you train them interspersed with other skills as you are just starting out, the benefits will soon become tangible. This is a hard one for new players to accept because EVE can progress so slowly and you simply have to take this advice on faith. 1 Is The Loneliest Number – Sappy quotes aside, in EVE you need friends. There is so much about EVE that simply cannot be experienced solo, and for that you need a Corporation. Being motivated to find a good group of people can be tough for a new player, there’s just so much other stuff going on. However, this truly needs be one of the first things new players should look into. Thankfully there are a ton of great, friendly Corporations out there, such as EVE University, that exist solely for the purpose of providing help, support and a great community to players. However, finding and understanding what they are all about can be a real challenge initially, I know I struggled with this greatly. So don’t be afraid to reach out and ask people if their Corporation is recruiting. The worst they can say is ‘No’ and the potential upside is huge. So there you have it, the advice I would have given myself when I was first starting out in EVE Online. Thanks for listening. Pingback: EVE Blog Banter #16: Dare to be Bold!